Aptus Heavy Seismic Battery Racks, for flooded batteries, are certified to IBC 2012 essential applications. Approved by a California Structural Engineer and meet the toughest rack design standards. Universal configurations support most manufacturers’ common battery sizes. Aptus flooded battery racks offer smart rack solutions utilizing proven technology combined with advanced features to reduce installation costs. 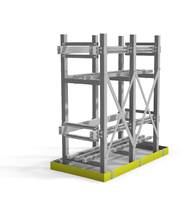 The racks are easy to assemble, designed to fit most manufacturers’ battery models, and feature optional UL Listed integrated spill containment systems with neutralization and absorption. High production capacity enables Aptus to ship most common rack configurations in only a few weeks, providing on-time delivery that matches manufacturers’ quick ship programs. Stocking programs are available. All rack frames are fully welded and feature ANSI 61 gray FR acid-resistant epoxy powder-coat to ensure longevity in standby battery applications. Custom racks are available. All racks offer environmental compliance integration. The optional ECO Rack series integrates environmental UL Listed spill containment using new, patent-pending designs. Inter tier tray containment is also available. Insulation: ANSI gray acid-resistant Rail covers included for all battery rails. Lengths typically available from 2 to 20 feet. Splice kits are available for larger sizes.